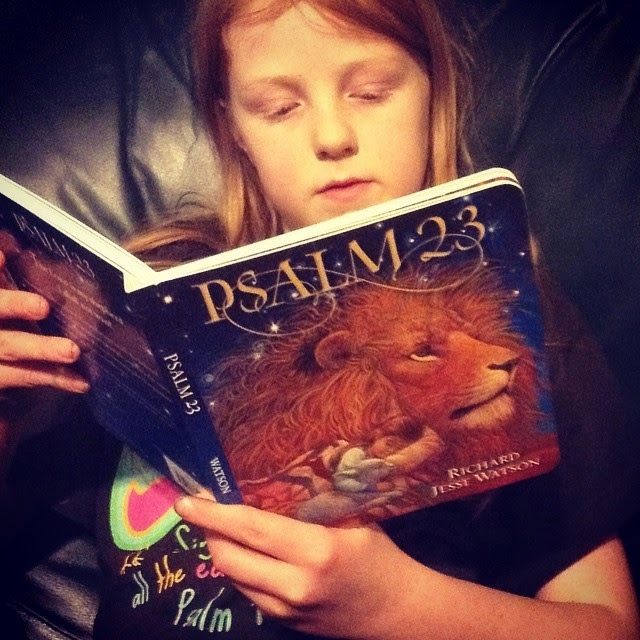 I've recently had the chance to review a really wonderful board book, simply titled Psalm 23. The author is David, of course. And that is the only text, in the King James Version. Illustrator Richard Jesse Watson really makes this a book to keep. The illustrations are fascinating, intriguing, memorable, and realistic. I thought, when I requested this for review, that we would go through it and then donate it to church. But after seeing the beautiful images, I'm not sure I will do that. This may be a keeper book, even though my kids are all 'too old' for board books. Watson also has a book out on The Lord's Prayer, and now I want to find that one too. I can tell by that cover that the illustrations must be beautiful! Oh, wow. I'm going to have to look for that! I'm surprised sometimes about the things I assume that my kids are "too old" for that they enjoy. With younger kids in the house, the older ones have an excuse to read younger kid books or play with younger kid toys, and I think there can be real value in that which we miss when we set age limits on things. One of the things homeschoolers are known for is not fitting into age boxes, right?